Angela Charles showed for the second time at Sladers Yard in this year’s Winter Show.If you are interested in buying a painting by Angela Charles, we will be pleased to arrange a viewing. Curator at the Thelma Hulbert Gallery in Honiton, Angela has a strong record of successful solo exhibitions at Sherborne House, Alpha House, Sherborne and the Porthminster Gallery, St Ives and is a popular artist at the London Affordable Art Fair. 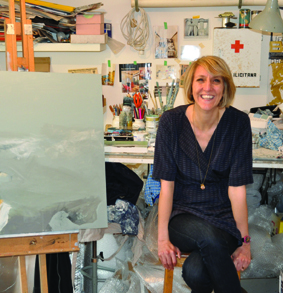 She studied Fine Art Textiles at Goldsmiths College, London and has been painting seriously since her move West in 2001. Angela Charles’ paintings are inspired predominately by the land and sea between her home in South Somerset and the Dorset Coast. 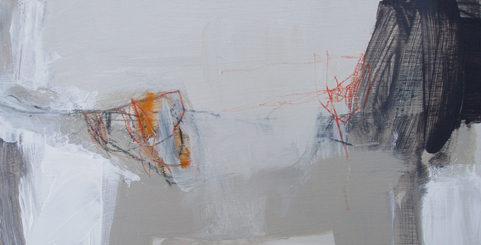 Working on aluminium panels or on smaller wooden boards, she builds up layers of sanded down paint before subjecting the painting to her incisive mark making, reflecting her memory of the place and her feelings whilst there, rather than a direct representation of the landscape. Angela Charles’s paintings in the current show can be seen below. Hover over a picture for details and click on it to enlarge or view as a slide show. Phone Sladers Yard on 01308 459511 or email gallery@sladersyard.co.uk to buy an Angela Charles painting. So interested to come across your amazing work! They are beautiful and evocative and resonate with all that emotion we have for landscape. Thanks for working so hard! Beautiful paintings. I shall visit the gallery (for the first time) in order to see Angela’s work. They are truly beautiful paintings. We shall look forward to seeing you!